When searching for a new pet tree frog, it is always preferable to acquire a captive bred rather than wild-caught specimen. However, captive bred specimens do pose one potential challenge: most captive bred frogs offered for sale are incredibly small. Very small frogs require tiny food and diligent care. Just as various tree frog species have different adult sizes, the height and weight of newly metamorphosed froglets vary slightly from one species to the next. Newly metamorphosed grey tree frogs (Hyla chrysoscelis) are about 1/2 inch long and 1/4 inch tall. 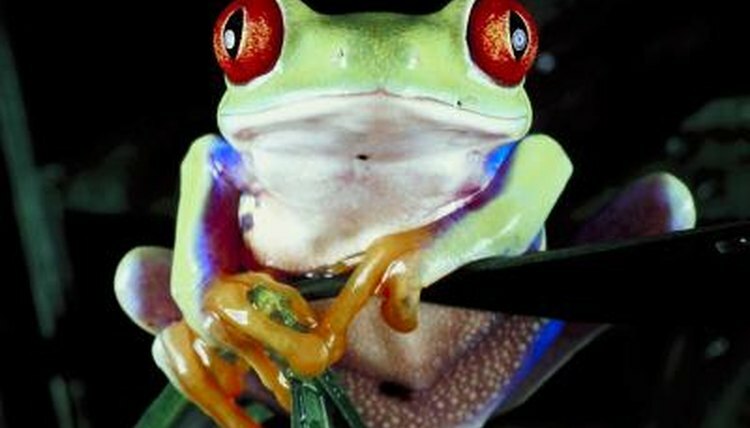 Froglets of very large species, such as dumpy tree frogs (Litoria caerulea), may be almost 3/4 inches in length and 3/8 inches tall upon metamorphosis. Newly metamorphosed tree frogs have incredibly low mass; most have weights in the range of 1/100 to 1/25 of an ounce. Because they are so small, newly metamorphosed froglets require extremely small food. Many species require pinhead crickets or flightless fruit flies for prey. Additionally, because of their small size, tiny tree frogs have a very high surface to volume ration, which causes them to overheat and dehydrate much more rapidly than adult frogs do.